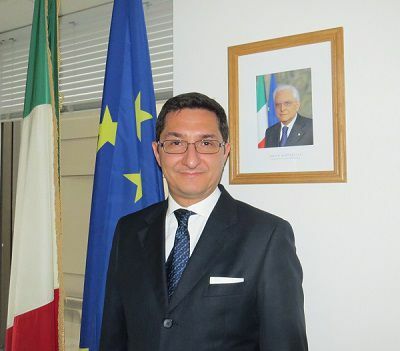 He joined the Italian Ministry of Foreign Affairs in 2001. His first assignment was at the Department for Diplomatic Disputes and International Agreements. He served abroad as Consul in Cologne, Germany (2003 – 2007), and as Deputy Head of Mission at the Italian Embassy in Kiev, Ukraine (2007-2011). In 2011 he returned to the headquarters of the Italian Ministry of Foreign Affairs in Rome to work at the Office of the Inspector General, where, among other responsibilities, he was in charge of the anti-corruption policy of the Ministry. In 2012 he was promoted to the rank of Counsellor. On July 28, 2014 he was appointed as Head of Unit for Internal and International Legal Affairs within the Department for Legal Affairs, Diplomatic Disputes and International Agreements. On May 11, 2016 he took office as Consul General in Chicago, Illinois, whose jurisdiction includes Colorado, Iowa, Kansas, Minnesota, Missouri, Nebraska, North Dakota, South Dakota, Wisconsin and Wyoming. In 2017 he was promoted to the rank of First Counsellor. Married to Mrs. Fabiola Di Clemente. He is proficient in English, French, Spanish and German and fluent in Russian.